Divided consciousness, assimilation, and stereotypes: many fine first collections have been written that explore these issues; in other words, the experience of being a hyphenated American. Even the best of these books, however, tend toward a similar approach. As they explore identity, they establish binaries, casting one culture against another, often while expressing a sense of estrangement from both. In her first collection, The View From Zero Bridge, Indian-American poet Lynn Aarti Chandhok avoids that approach. 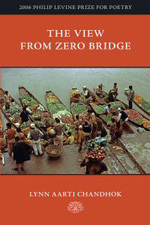 While she does transition the reader back and forth between India and Brooklyn, her interest mainly lies in the assertion that, “On either side, the only truth is loss.” The poems in The View from Zero Bridge emphasize convergence rather than division, and for Chandhok the point of convergence most often is loss. the pieces of her bones that have endured. as ash, into the bag. Then tie it up. For hours, drive the road along the river. the daylight. Disembark. Remove their shoes. but tender. Balance and untie the bag. By handfuls, place her gently on the water. negotiate the river and its stones. but watch as, with the petals, she departs. She travels fast, her stiffened body gone. then flicker, undiminished, in my eye. Chandhok does not call particular attention to what a Western reader might find foreign in this scene, nor does she use the poem to launch a comparison of Indian and American death rituals. Instead, she documents the scene with reportorial care—the men do this, and I do this—which creates for the reader an expectation that what follows is factual. She also stands aside, not casting bones, but watching, and her detachment allows for empathy and the possibility of consolation. In the space that Chandhok creates between herself and the poem, readers are allowed to slip in, to palm some warm ash and feel it sift through their fingers. remind me what seems permanent will change . . . In Kashmir the earth holds blood like memory, linking loss to nature. In Brooklyn, a month after 9/11, the natural world seems able to support the speaker, but the black water and the railing—and what a wonderful word choice “railing” is, with its connotations of protest and of being out of control—remove any illusions of permanence. Again, the care given in the description of each place emphasizes what is familiar rather than what is strange, and creates the opportunity for the reader to experience rather than observe. rowed back to Dal Lake’s maze of floating gardens. The narrator observes from the periphery and these observations accumulate into a rendering of a unique and knowable place where locale and action are inextricably linked. Chandhok creates this convergence through a heightened awareness of how sensory details accrue to create an experience that transcends geography. Her poems have a rich physicality, full of texture, sound, and color. In a marketplace in Kashmir, “lotus lay, flat-leaved, blooming in bright / profusions out of quiet pools,” while in the Brooklyn Botanic Garden, “The rose petal, translucent in late sun, / reveals a web of veins that arc and spread / around themselves like curls of silver wire.” Chandhok’s portraits are acts of attention created with a panoptic awareness that ultimately makes whatever world she represents tangible and real. that spew blue waterfalls of peacock eyes. and tamp the knots down, turning blade to gavel. in blood-red stains. Everywhere, reds unravel. and weave into the prayer rug’s pale silk heart. This poem itself is meticulously crafted and beautifully realized. The form and the content merge seamlessly. Chandhok’s prowess with creating vivid imagery is a true pleasure. One can see the slants of light, the children’s fingers darting at the weft, hear the plink and watch the blood-red spittle seep into the ground. By taking such care with her images, the poet has created an intimacy and familiarity that transports the reader into a world that is fully formed. The specter of child labor hovers over “The Carpet Factory,” and Chandhok confronts the issue through imagery rather than polemics. The children’s fingers are enraged yet fragile, they tie and cut and tie and cut, and the repetition, the act itself, is “bereft of music.” The line break after “bereft” allows the weight of what it is to be stripped, to be without, to hang in the air. And how not to see these children as “the bended limbs of saplings”? Chandhok’s approach is subtle yet ultimately more compelling than an overt indictment. The collection as a whole is fully formed and the poems display an impressive emotional depth that is driven by a remarkably mature voice. The natural world is a unifying and universalizing force, and Chandhok is scrupulous in her lush descriptions. The poems in The View From Zero Bridge are inviting and sensual, they create a milieu the reader can fully inhabit, and, by making the strange familiar, they allow for the possibility of understanding and hope.